Pretreatment plant To start with the basics , what is pretreatment - it is a system or a way by which a component either steel or aluminum or plastic or any other is been thoroughly cleaned. In everyday use we do lot of pretreatment process for eg : washing hands , washing utensils , etc but these can be said as softer way of cleaning. In industries where there is production of steel casting , aluminum extrusions , steel forging etc material passes through high temperatures of heat to achieve desirable shape and sizes .Often steel material during machining works also pass through series of machines for cutting , grinding etc . Sheet metal components pass through cutting and different bending machines. 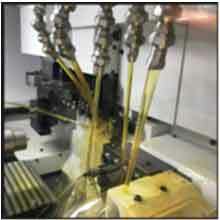 During all the above process oil is been added as coolant to reduce the abrasion between the tools and the shape to be formed , oil is also added after casting work is completed to save the components from getting rusted. These oils have a thicker density and cannot be removed easily by cotton waste wiping, if such components are to be painted or powder coated , there are high chances of complete failure of paint or powder film. Therefore pretreatment system comes in to picture to remove the deficiency due to oils and increase efficiency of painting system or powder coating system. Similar to removal of Oil & grease , there is one more element that needs a trough removal by pretreatment solutions , That is called Rust or iron oxide or aluminum oxide . Rust is far more dangerous than removal of oil. 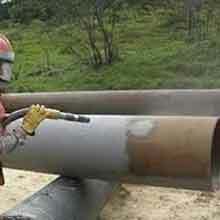 As oil is been applied from out side , rust generates from with in the steel or metallic components . Heat and moisture in the air react with the surface of the metallic surface in creating reddish surface to form rust. If components or raw material after machining or and other sheet metal work as been kept lying in the factory unit for couple of days than the rust generations takes place , the rust component enhances if the parts are not been coated with paints or powder coated .Autocoat Engineering has spent hours in understanding the rust generation process , and with communication with different chemical suppliers we create the best pretreatment systems , so that our customers' requirements are hassle free. 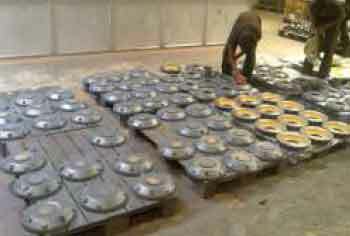 a) Pretreatment for Painting Line - Before any kind of painting the parts need to be pretreated . This can either happen by Mechanically or Chemically. 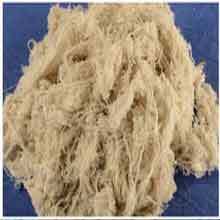 Mechanical Pretreatments are normally cleaning by abrasive instruments like copper wire brush , but these can clean the products to a certain limit .The Higher level of mechanical pretreatment system is but hammering shots or sand particles to a product in a enclosed chamber , this process is called Shot blasting process or sand blasting. The bombardment of minute steel shots on the surface of the metal at high speed and pressure causes such an impact, that the rust on the surface is broken down into minute pieces eventually leaving the metal parts. This kind of process is normally done for large steel structures, since the area available in structural's is very high. If same process is used for smaller steel parts, then proper jigging & alignment need to be done , but when this process is used for smaller parts , lots of edges and corner often escape the process, leading to accumulation of new oxidation from these areas. 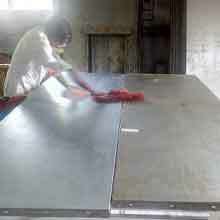 b) Pretreatment plant for painting by chemicals - This process is a bit complicated type as different chemical baths are stored in large or small tanks, when steel parts are passed through these chemicals desired type of cleaning action takes place. As explained above, removal of the two major components oil & rust is the criteria for good painting or powder coating. At localized level where people can not invest in large pretreatment process or shot blasting, 3 in 1 solution seems to be a very economical solution. Here the 3 in 1 solution comprises of degreasing + de-rusting + Phosphate chemicals mixed together in a very dilute concentration to give the parts a softer way of cleaning. The much superior methods of cleaning are 7 tank pretreatment process, 10 tank pretreatment plant.these pretreatment systems are either Dip Type pretreatment process or Spray type pretreatment process. Part 1 - Dip type system manufactured in such a way that a batch of components either jigged together or accumulated together in a cage(basket) and dipped in various chemical baths at different temperature or at ambient to get a desirable cleansing of the parts. The process of dipping is normally been carried out with the use of chain pulley bocks or electrical hoist systems or transporter system.